** Originally printed in the 1998 Stallion Issue of The Crabbet Influence magazine. Articles on the great Crabbet names of yesteryear can often seem to bear little relevance to the breeding of today. It is a fact that, in Straight Crabbets in particular, the genetic pool in England is surprisingly limited and any Crabbet horse you care to mention is likely to carry at least one line if not more to Rissalix, Oran, Raktha and Silver Fire let alone the original imports, the majority of which will be in absolutely everything. Nonetheless there is variation in type. It therefore seemed a useful exercise to review the more important Crabbet sires of recent years that have made a striking contribution to the Crabbet cause. The stallions I have singled out are all well known show horses and sires to English breeders whether or not they are Crabbet enthusiasts. They are General Gold, Silver Flame, and Silver Blue, two British National Show champions and one Reserve International Champion. They are not the only Crabbets to exert influence on the current UK show scene but they are good examples and reflect my personal taste. The first is the 1973 chestnut General Gold, British National Male Champion in 1979 and the only one of the three that is still with us today. His pedigree is 100% Straight Crabbet with a double cross to Razina on the Rissla female line with the tail male line going to Skowronek. He is a substantial horse by modern standards but with considerable quality, excellent action and the most superb shoulder structure I have ever had the good fortune to see. 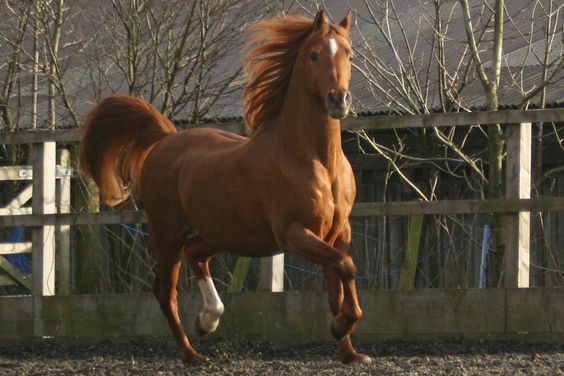 Pronounced high knee action has not traditionally been considered a desirable trait in English Arabian breeding so, when I say that General Gold has an excellent trot, I mean that he has good athletic cadence and natural hock engagement but moves freely from the shoulder with a long stride and no excessive height. Unsurprisingly his stock has done well under saddle, as well as in hand, against Arabs and non Arabs alike. He was bred by, and has been owned all his life by, Caroline Murray’s Foxbury Arabian Stud. General Gold has not been at public stud for many years now so those of his stock not bred at Foxbury are themselves mature horses and progenitors these days. His progeny invariably inherit substance, superb shoulders and a symmetrical, square structure that looks equally well under saddle as in hand. Good tail carriage and action is standard for almost all Arabians bred at Foxbury. These are horses that manage to appeal to horsemen usually suspicious of Arab blood. General Gold is now retired but a visit to his home in the Cotswolds would introduce you to a young son, General Reflection, and a daughter Rosegold. They are just three years old and it is to be hoped they will stay in England to add to their sire’s legacy. The senior General Gold son in England is Golden Cavalier (x Crystal Gold by Fari II). He was bred at Foxbury and his dam is a ¾ sister to General Gold’s own dam. He is by no means Foxbury’s only experiment in breeding close to this family. Dreaming Gold, full sister to General Gold’s dam, was also bred to him and produced the good quality colt Valiant Gold who was exported to Iraq. Golden Cavalier is a successful sire in his own right with his grey son Imad (x Ivory Wings by Silver Blue) already making a name for himself as a sire too. Imad was joint leading sire at the 1992 UK National Show and won the sire produce group class. Both horses had successful show careers and exhibit the substance, shoulders and good length of quarter one grows to associate with this breeding. Imad is now a graded performance tested stallion as well as a sire of National show winners such as the fillies Dahisha and Canzonetta. The other extremely successful scion of the General Gold line was not bred at Foxbury but at the Briery Close stud that owned General Gold’s sire General Grant. This is Golden Samurai (x Amaveda by Count Rapello), a top show horse in his own right and a sire of numerous show winners. A medium sized dark chestnut with superb neck and shoulder and an imposing air of refinement that has little in common with the dainty prettiness of so many modern show horses. He carries an interesting second line to General Grant’s dam, the Riffal daughter Samsie, and this may be a contributing factor to both his dark colour and particular brand of elegance. The most successful Golden Samurai son to date is yet another dark chestnut, Shogun. He has had great success on the European show circuit and proved that you do not have to be the latest fashion in bloodlines to do well. Another General Gold son is the Straight Crabbet General Lee Gold (x Leda by Orion) who has done extremely well in the performance field, winning in BHS affiliated cross country events and horse trials. A substantial but handsome horse with that huge front, he is also a sire of quality and has produced the good ridden show champion Red House Ziona and the show filly Lamees. The General Gold daughters are also producing well although there are not many still in the country. Success has its own pitfalls and, with few visiting mares, the General Gold progeny are not huge in number with many sold abroad. Nonetheless Desert Rose (x Sianah Gold by St Simon) is producing well for the Cooke’s Stourvale stud and her son Gold Seyal (by Spearmint) has now replaced Golden Cavalier as one of their two stallions. The Straight Crabbet mare Grecian Gilt, a granddaughter of Silver Gilt, produced the good stallion Mystic Gilt (by Myros) and has now had an elegant colt by Silvern Idyll for Binley Stud’s Straight Crabbet program. Also at Binley is a young Straight Crabbet colt Prince Iman who is out of the General Gold daughter Princess Gaila (x Princess Alia). He has, of course, inherited that General Gold shoulder. Grecian Gilt has a younger full sister in blood called Golden Sunfire (x Sunset) who was exported to the USA. She is worthy of mention as she has joined the Straight Crabbet program at Clipper Winds Farm and already has two very promising sons by RAS Royal Magic and Star Reflection. Younger horses by General Gold include the lovely National show in hand winner, Getana (x Gemanta by King Cotton Gold) co-owned by Jean and Dave Peck and Mrs. Iona Bowring and the British National Ridden Champion, Chalyska (x Chantilla by Fari II). There is also the classically bred young mare Silver Sylph (x Silver Starlet by Indian Star) also co-owned by Jean and Dave Peck and Mrs. Iona Bowring, and still more youngsters in the wings. These are stunning Arabians who still hold their own in the showring but are also quality athletes with considerable performance ability. Silver Flame was foaled in 1970 and was British National Champion stallion in 1982. He is another whose stock have done well in the showring as well as in performance. He was bred by Rosemary Archer and was owned for much of his life by her Worth stud in partnership with Lady Ann Lytton, daughter of Lady Wentworth. On Lady Ann’s death he moved to the Bretherton’s stud where he spent his last years. The pedigree is classic late Crabbet as he is the result of a Silver Vanity daughter bred back to a son of the great Indian Magic. Despite his own grey colour, he was closer to his sire Indian Flame II in conformation and style than to his maternal grandsire and flashy chestnuts are as likely to inherit his extreme type and style as the greys. This may be due to the three strong lines he carries to Rissla, two of them via the beautiful Naziri daughter Risira (a full sister in blood to Rissletta, dam of Abu Farwa), although he also has two lines to Oran. His tall, reachy structure must go down to the later Crabbet look of Oran and Indian Magic. Silver Flame’s earlier sons include Golden Spark (x Silver Mantle by Manto) who went to Australia and the impressive Golden Khalifa (x Comforts Caravel by Indian Magic), both tall, flashy chestnuts. Golden Khalifa had a good show record and sired a few foals before being sold to the Middle East. 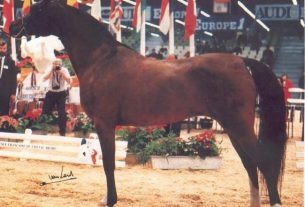 Golden Flambeau was another chestnut son to make his mark, being Reserve International Male Champion at Ascot and also amassing many honours under saddle both in the showring and in affiliated dressage. The greys were horses such as Silver Ruler (x The Lady Honorine), Alain (x Meshel) and Gleam of Flame (x Bright Gleam by Aldourie). They were typical of the tall, elegant type sired by Silver Flame with long necks, high tail carriage and long, ground covering strides. There was even a refined bay son, Aeneze (x Athene II), with a second line to Silver Vanity and an excellent show record as a colt. Whilst there are a number of memorable sons, they tend to be eclipsed by the daughters. Mares such as Azeme Bint Gleam, Mahrussa, Silver Mouse, Mayada and Sa’lilah are just a few that spring easily to mind. They would decorate any program and have bred on well. Azeme Bint Gleam is a full sister to Gleam of Flame. Her fame would have been assured if she had only produced one foal, the chestnut stallion Aboud (by Diamond Star). Aboud carried a second line to Silver Gilt as well as a line to Indian Star, full brother to Silver Flame’s sire Indian Flame. He is a tall, long necked and glamorous horse with the style and action that you would expect from the breeding and, despite being exported after only a few seasons at stud, has left a definite legacy behind. His daughters, the full sisters Zabelia and Zaphelia, placed well up to the national level. Zabelia managed to win the Princess Muna saddle of Honour for family groups at the National Show at the tender age of 8 years old. He was bred back to his own daughter to produce the young sire Ibn Aboud who, in turn has sired the lovely young show colt Star of the Seasons. Aboud was not in fact Azeme Bint Gleam’s only foal. She also produced the 1990 British National Champion filly Aureme (by Aurelian – A Ben Rabba son) and earlier Israeli National Champion Mare Abbah, sired by ben rabba. Aureme is the dam of Star of the Seasons, who thus carries no less than three crosses to Silver Flame close up in his pedigree. Azeme Bint Gleam’s last daughter is the lovely chestnut Alize Bint Azeme (by Istfahan). Silver Mouse (x Lindaraxa) also bred some double Silver Flame foals by Gleam of Flame including the flashy chestnut show filly Gleam of Gold. She is a good example of two very “Silver” grey parents producing the flashy chestnut Silver Flame stamp. The Straight Crabbet Sa’lilah (x Sunset) has spent her entire breeding career in an all Crabbet program. She produced a string of colts to start with but all good ones, unfortunately for England all exported. They were the grey Seyad (x Silver Scimitar) and the chestnut full brothers Sa’ika (by Prince Saraph) and Seffer, all exported to the USA. Seffer in particular represents the stylish, big moving Indian Flame look (indeed he carries a second line to Indian Flame via his sire’s dam, Princess Alia) and seems to be combining well with New Albion’s CMK mares. A full sister to Seffer finally arrived, a small neat grey surprisingly, and has been retained by Worth Arabian Stud. She was followed by the dark chestnut Siala (by Shiffal) before Sa’lilah herself moved on to Binley Arabian Stud, where she now appears to have switched to fillies permanently. 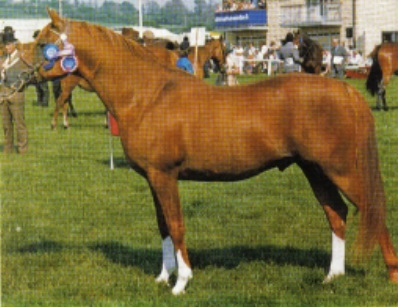 A tall and elegant chestnut filly by Silvern Idyll, called Sefina, arrived in 1994 and placed well at the Wessex Regional Show as a yearling. She has been followed by another chestnut filly Sa’ira (by Indian Idyll) in 1997 and there are hopes of a foal by another Princess Alia son, Prince Sadik, before she retires. One cannot help but feel that Lady Wentworth would have approved of these tall, elegant fillies with their ground eating stride, so typical of the Silver Flame look. The Silver Flame line continues to produce big, athletic horses such as Golden Flambeau and the race horse Seheran. The fact that they are elegant enough to win in the modern showring is a testament to beauty and performance not being incompatible. 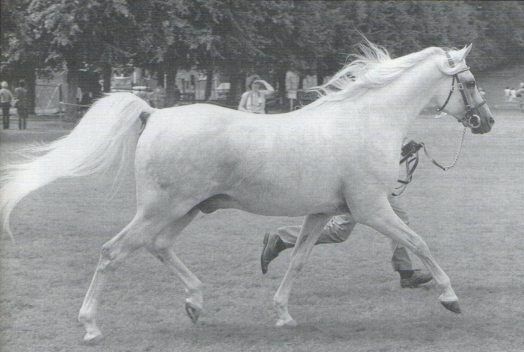 Silver Blue was a 1969 grey and is the third of the stallions I have singled out as a major contributor to British Arabian breeding. He was Reserve International Champion in 1977 and is also of Straight Crabbet breeding. His reputation rests largely in the hands of the Wright’s Moulton Stud, producers of champions for many years and amongst Britain’s most gifted breeders. They owned him jointly for most of his life with the Marchioness of Townsend’s Sky Arabian stud and he produced admirably for both. 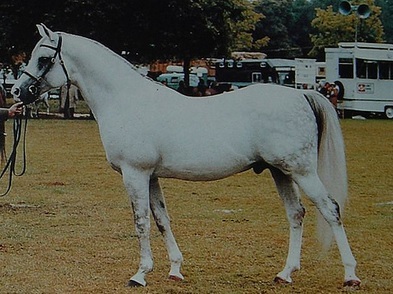 Silver Blue came from one of Crabbet’s most illustrious families, being a son of the great mare Silver Sheen who, with her dam Silver Grey, dominated the Female championship at the National show for many years. Silver Grey, of course, was one of the best daughters of Silver Gilt. The stallion’s sire was the Blue Domino son Azrak, son of another great mare Silent Wings. Her daughter by Indian Magic, Yemama, was one of the Wright’s foundation mares so many of the Moulton Stud Silver Blue progeny carry two crosses to this line which may have contributed to the consistent high quality of the foals. 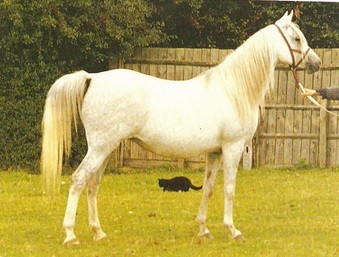 General Gold could be said to be breeding on predominately, though not exclusively, via his sons while Silver Flame is known largely for his daughters but Silver Blue was a horse whose reputation rests equally with his male and female progeny. 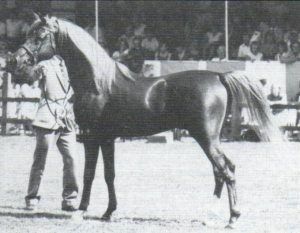 The Sky Arabian studwas based on imported Polish mares such as Nawarra crossed with the best that Crabbet had to offer. Silver Blue was used along with Indriss on Nawarra and her daughters by Oran. The results have a reputation in the showring and on the racetrack. Apollo Sky was a champion in hand while his full brother Sky Hermes won his ridden class at the Nationals. The full sister, Atlanta Sky, was a champion in hand and placed racing as well. 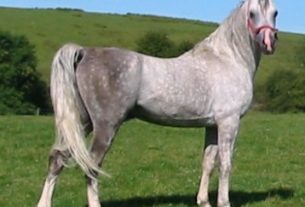 Sky Silver Buck was another race winner and the young stallion Sky Eagle (x Sky Cinders) is a European qualified show horse who is being used to continue the tradition of good looking, good moving athletes. Other breeders have also used Silver Blue. In addition the Wright’s mares turn up as the foundation stock to many a quality English program. The young son Silvester Blue heads up a new Straight Crabbet program in Norfolk which is encouraging when the Moulton stud itself is reducing. The Moulton Stud Silver Blue progeny read like a list of champions. The Yemama daughter Silent Dove (by Ludo) produced a whole string of top foals by Silver Blue including the lovely show mare Silver Blue Wings, dam of the Wright’s current junior stallion Winged Saint (by El Santo). Ivory Wings has been a consistent broodmare for Jane Kadri’s Al Waha stud, producing the stallion Imad (mentioned previously as a General Gold grandson) and the elegant mare Inass. The dry quality of the “Silver” line combines well with the distinctive style of the Sharima family and the movement of Blue Domino. All these elements seem to persist strongly through successive generations. Silver Blue Dream (x Dancing Dream) achieved fame as the most expensive yearling filly sold at public auction of her time. The Wright’s breeding continues to be in demand and you will find horses of Moulton Stud lines as far away as Australia. Silent Dove’s full sister’s daughter, Golden Ludo (by Ludo), also proved an outstanding breeding partner. The Wrights have retained her son Silver Blue Ludo, who is a successful show champion under saddle, but the best known of his siblings is probably the stallion Golden Silver. 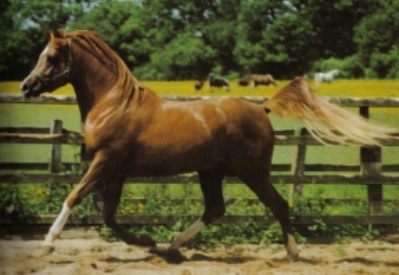 Golden Silver won his stallion class at the National show in 1986. He is a first rate show horse and an excellent sire. Unlike his own sire, he does not have the benefit of belonging to an established stud with a group of their own quality mares but he has still managed to sire more than his fair share of lovely horses and from a variety of mares. The Golden Silver fillies so far include Diamond Wings, Silver Light and the ill-fated Crystal Rose (x Crystal White Gold). His sons include Shabash (x Silver Silk), who placed second at the National Show in 1991, and Sun Crescent (x Magics Moonshadow), Champion Yearling Colt at the 1986 Nationals and doing well as a sire until he was gelded to concentrate on a ridden career. Sun Crescent’s daughters too are breeding on well. It is only sad that so many breeders are using them exclusively to cross with imported bloodlines rather than preserve a type that is worthwhile in itself. Space does not permit a mention of every successful Arabian that is indebted to General Gold, Silver Flame or Silver Blue. Were one to list every show champion, one would still just scratch the surface. The truth is that the majority of these lines are bred by small breeders, most of whom prefer not to attempt to compete with the professional production of the large commercial stud farms. Their horses are to be found in the ridden arena doing dressage, jumping and generally being the supreme riding horse that the beautiful warhorse of the Bedouins has always been.